As leaders spar, concerns increase and calls for peaceful negotiations grow louder. President Donald Trump and North Korean leader Kim Jong-un traded insults early on Friday, continuing a war of words that’s gone on for months, causing widespread anxiety over the possibility of a nuclear attack as North Korea conducts missile tests and Trump administration officials attempt to do damage control regarding the president’s threats of retaliation. 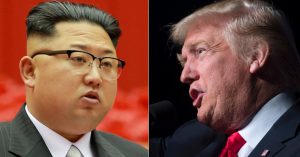 The two leaders’ statements have grown increasingly antagonistic, with Trump giving Kim the nickname “Rocket Man” last week and Kim introducing the arcane term “dotard” into the discourse Friday morning. Trump responded on Twitter with his own shot at Kim’s mental state. The U.S. announced its latest round of sanctions on North Korea Thursday, penalizing foreign companies from doing business with the country and likely adding to the impact of its food shortage. Meanwhile, a number of diplomatic officials and prominent activists have called for peaceful negotiations between the U.S. and North Korea. Defense Secretary James Mattis has warned against military action on North Korea, and on Friday, nearly 300 female leaders from 45 countries called on the U.N. secretary-general to appoint a special envoy to de-escalate the brewing tension. In a poll conducted by NPR/Ipsos just before Trump’s speech at the U.N., 51 percent of Americans said they didn’t approve of how the president has been handling North Korea’s nuclear threats.